On a Memorial Day trip to North Carolina we stopped at the Lodge Factory store in Commerce, GA. It was a good thing our car was pretty well packed because these mini skillets were about all I could fit into it. I have the next size up too, but they are a bit big for an individual dessert. See the brownie skillet post. The week 20 recipe in the 52 Week New Recipe Challenge is mini skillet chocolate chip cookies. 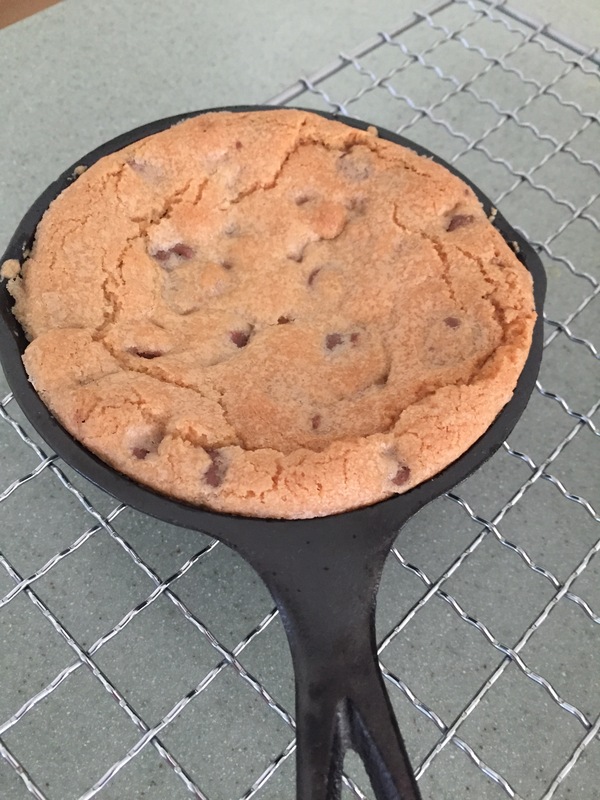 Now, if you don’t have the 5-inch cast iron skillets you can make one big cookie in a 10-inch cast iron skillet. I served this treat to my family on the last Saturday of summer vacation. The family consensus was this recipe is a keeper. My oldest son even saying it was one of the best desserts I’ve ever made. If you’re using the mini skillets you could substitute mini-chocolate chips but I used the regular size. I gave my kids a choice of semi-sweet chips or milk chocolate and they chose the milk chocolate. Either would be fine and you could even use white chocolate, butterscotch or peanut butter chips to mix things up. The original recipe, from Everyday Food, said it served 8. I got 4 servings which was perfect for my family in the mini skillets. (Using the larger 10-inch skillet would yield more servings.) While you could enjoy this in one sitting, I chose to save some for another treat. I covered the skillet with foil and kept it on the counter. Just as tasty the next day. Serve with a dollop of whipped cream and shaved chocolate or a scoop of vanilla ice cream for an even more decadent dessert. Mini Skillet Chocolate Chip Cookie warm from the oven. Combine butter and sugars in a bowl with electric mixer on medium speed. Mix until light and fluffy. Mix in egg and vanilla. Stir in flour, baking soda and salt. Stir in chocolate chips. Transfer dough to four 5-inch cast iron skillets or one 10-inch cast iron skillet. Spread evenly and smooth top. Bake 18 – 20 minutes, a little longer for the 10-inch skillet, until golden brown and just set in the center. Cool 5 minutes before serving. Note: The center will fall a bit but the taste is not affected. Makes 4 servings in the mini skillet. Makes 8 servings in the 10-inch skillet. This entry was posted in 52 Week Challenge, Company Worthy, Cookies, Desserts, Entertaining, Kid's Favorites, Sunday Dinner and tagged 5-inch skillet, butterscotch chips, cast iron, chocolate chip cookies, Lodge cast iron, milk chocolate chips, skillet cookie. Bookmark the permalink. Looks delicious! I pinned it! Thanks, Nancy. Let me know if you make them and how you like them! What fun! I don’t usually click on cookies, but this one really sounds and looks so fun – i’ll make it when my grand baby gets older! thanks!! !